The next day (10/17) we drove south and then north somewhat in NM, and over some very lovely mountains, the southern end of the Rocky Mountains, really, and down the Chama river Valley. Fall color was in evidence everywhere - yellow aspens and cottonwoods - to Española and then, at the Rio Grande, up to Taos, where we found a motel. 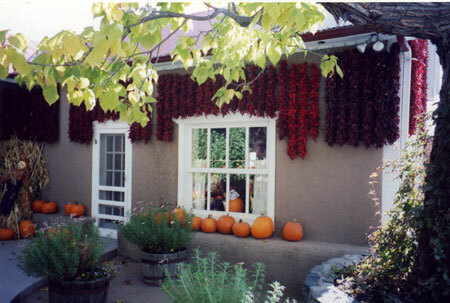 In Taos, we went from shop to shop, from gallery to gallery. This town is indeed totally boutiqued and pixelated, which we did not mind, because the level of craft was sufficiently high, and most of the shops were significantly good and quite different from one another. Happy Hour at the Alley Cantina was a pleasant respite from the shopping. Candace liked the margaritas. The next day, we did some more looking at Navajo and Zuni jewelry, and pottery from the Rio Grande pueblos, which put a dent in the old wallet, plus the paintings and the other crafts, and on and on and on, until we couldn't take it any longer, picked up, packed up and drove down to Santa Fé‚ via the Sangre de Cristo mountains and the old town of Chumayo, where we had a New Mexican lunch at the Rancho de Chumayo and visited its venerable chapel, the Sanctuario. We liked Santa Fé‚ right away, because by great luck and instinct I found a fabulous restaurant that served Asian style food, Mu Du Noodles. This place was packed. Interesting food.-- After a swim and a sleep at the Quality Inn, our good old standby, we got up early the next day and went downtown, where we had a long walk in and around the State Capital Building, a great round building in the style of a kiva, with art work by New Mexicans on the walls. We really liked this buffalo head made of manufactured objects, found objects and junk, like video tape old brushes. -- Oddly enough there was no security in sight except at the entrance, - much to our surprise - in these exiting and nervous times. Then we walked downtown and visited several art museums. Just before noon, we drove up a hill at the outskirts of town to a museum dedicated to Native American Arts and Culture, where we found one large room devoted to pottery. It was an important collection, and covered the range of different pueblo styles quite well. Candace had already realized that the Southwest was and extensive trove of pottery art, but was unprepared for the scope and reality, the depth and history of this ware. -- Somewhere along the line, from one of the books on pottery that we bought, we found out about an establishment named The School of American Research, which was supposed to house an extensive collection of pottery. We called, and as luck would have it, were able to take part in a very small group tour that very afternoon. The SAR is, as the title suggests, a research institution, only a short distance from the museum complex on the outskirts of Santa Fé. One of its buildings is devoted to Native American arts of the southwest. Their collection of pueblo pottery from the Rio Grande and Acoma and Zuni areas is probably the most extensive there is. Our docent was a woman who could have been sharper about the whole subject. Nevertheless, her attitude was great and her heart was in the right place: Though the collection is indeed vast, it is not displayed in museum style, but in large floor to ceiling racks, and we had to breeze through the large rooms that are essentially temperature maintained vaults, at a rather brisk pace. 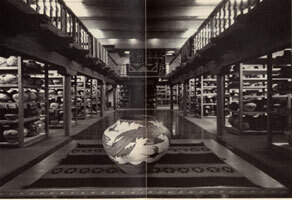 All in all they have eleven thousand items there, plus an extensive collection of rugs and basketry and kachina dolls. Despite the pace, we were able to get an overview of the pottery which particularly interested us. Suffice it to say, that we now know the look and some of the motifs of Acoma, Zuni, Jemez, San Ildefonso, Santa Clara, Zuni, Zia Hopi, and a bit about the lives of Maria Martinez and Fannie Polacca Nampeyo, the great Hopi potter. The point of the trip was becoming clearer all the while. It was about the great landscapes and views, the geology, the marvelous sense of sky and air, and then about the ruins and the people who had made them, and finally, about their use of the earthen materials they had at hand to create an art form imbued with practical and religious purpose, an art form that has a longer tradition, more rooted in a landscape than any other we know. We were astonished in the many shops and galleries at the fine workmanship of the mainly, coiled and highly decorated pots. We bought few small pieces. Unfortunately the larger vessels command prices that are out of our range. Seldom did we feel that they were not worth it, however. Taos and Santa Fé‚ were definitely one of the great high points of our trip, except for a few poor choices relating to breakfast at the motel that resulted our orders being totally covered in an adobo sauce smothered with grated American cheese. -- We had little time for the classical tourist stuff in Santa Fé a town with decidedly too many shops and boutiques, a trait it shares with Taos, where the commerialism is offset by its smaller, earthier quality: the message is clearly, 'buy me, buy me' Both towns have definite architectural styles and Santa Fé has a definite sense of chic all its own. The ladies sport lots of silver and turquoise jewelry wherever they are, in restaurants, walking down the street, or talking on cell phones while spinning around town in their white Range Rovers. Since both of us are intrepid flea-marketiers, we knew we couldn't leave the Santa Fé area behind without visiting the one at Tesuque, four miles north of town. We got out there at about 9:30 or so, and did not manage to leave until close to noon. Quite amazing. This place is devoted to peddlers, who shop the world for folk art goods. The area is about the size of the Sebastopol Flea market, but better organized. It is really a market for peddlers, and not for folks who are just getting rid of some excess household goods. There are several who sell rugs from the area in which we are now engaged in a war, very nice stuff and reasonably priced, too. Lots of Mexican and Asian stuff, and some jewelry, too, at the best overall prices we found in the Southwest. It was hard to tear ourselves away, but we had to. No more cash.